If you’ve only got 24 hours to spend in Havana, here are the things you absolutely must do. 2. Bond with Havana’s baseball fanatics by immediately using broken Spanish to describe to locals what Mark McGwire looks like now: Baseball is one of Havana’s most popular sports, but Cuba is nearly 100 miles away from the United States, so they have no way of finding out what the disgraced, beautiful baseball hero Mark McGwire looks like today. 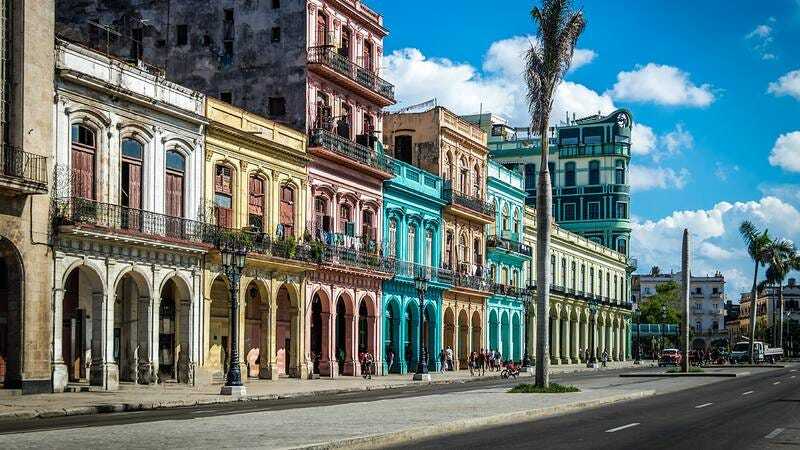 Live life to the fullest in Havana by using the best Spanish you can to describe McGwire’s “cabeza normal” (normal head) and his “brazo largo y grande… GRANDE y grande” (long, big arm… BIG and big). In this way, you can get the total Havana experience while everyone in the city learns about Mark McGwire’s current appearance. 3. Recreate the Cuban Missile Crisis by pointing your nuclear missiles at the U.S.: It’s simply not a trip to Havana unless you’ve trained your entire arsenal of nuclear missiles on a major U.S. city and caused an international standoff that threatens to annihilate the entire world, just like Cuba and America used to do way back in the ’60s! 4. Lead a failed invasion of Cuba to commemorate the CIA’s very own botched invasion at the Bay of Pigs: Once you’ve finished restarting the Cuban Missile Crisis, the next step for a perfect day in Havana is to attempt to invade Cuba and fail terribly, just like the United States did at the Bay of Pigs! If you’re lucky, you and your inadequate invading forces will even get put in a real Cuban prison and interrogated by members of the Cuban Revolutionary Armed Forces! 5. Ask a U.S. soldier if he will shut down Guantanamo Bay if you give him your shoes: This probably won’t work, but it’s worth a try, especially if you have very nice shoes.